While I’m not a huge fan of Halloween, I love haunted houses. The Haunted Mansion at Disneyland is my all-time favorite haunted house of course, however the Halloween season brings us some of the scariest places even imagined. 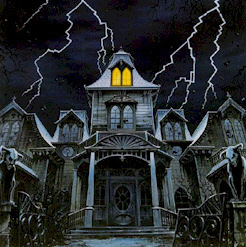 Hauntworld.com has put together their list of the top 13 haunted houses in America. In addition to the list, we thought we’d include video footage from each of these scary places. So sit back, and get ready to be frightened! Located in Philadelphia, Pennsylvania, Bates Motel & Haunted Hayride is located deep in a 200-year-old forest full of overgrown trees creating the ultimate dark trail. Guests will be on edge even before ever entering the first scene. Combined with a digital custom soundtrack, pyrotechnics and continuous scares throughout the ride, this hayride attraction is sure to create an ultimate haunt experience. Additionally, The Pennhurst Asylum is one of the scariest haunted attraction sites in the world, mostly due to its setting – located in a 100-year-old, abandoned mental institute. The building itself will instill real fear and true horror in even the bravest of souls. The Asylum has been investigated by professional ghost hunters and featured on Ghost Adventures and Ghost Hunters several times and found to be truly haunted. Located in St. Louis, Missouri, The Darkness rests inside a 100-year-old, two story warehouse and includes three attractions in one location. Experience two floors of fright with high tech animations, special effects, amazing scenes, over 50 live actors and much more. The Darkness also includes Terror Visions in 3D haunted house with crazed, insane clowns. Lastly exit through the all new Monster Museum with real like horror movie props from movie like Saw. Located in Baton Rouge, Louisiana, 13th Gate features levels of detail, set designs, and effects combined with outstanding actors and incredible makeup effects that can only be compared to the likes of Hollywood. With over 13 different indoor and outdoor fright zones that includes haunted asylums, claustrophobic cellars, a real snake-infested Louisiana swamp and much, much more, 13th Gate make this huge scream factory a top haunt on anyone’s list. New for 2011 is Necropolis 13, a 40,000 square foot New Orleans style cemetery complete with over 400 zombie-infested crypts and mausoleums. Located in Ulster Park, New York, Headless Horseman Hayrides & Haunted Houses is situated in the historic New York Haunted Hudson Valley and offers a second-to-none haunted scream park that features a massive corn maze, 6 haunted houses, a haunted hayride, side shows, 5 gift shops, 4 eateries, and even professional actors riding around as the Headless Horseman himself. The property incorporates over forty-five acres of naturally landscaping that includes foreboding woods, surreal ponds, and fruit orchards and in which night falls, provides the perfect setting for the ultimate haunting. Located in Atlanta, Georgia, Netherworld Haunted House has long been recognized for their originality of innovative scares and unique characters. Netherworld features an over-the-top production that many in the industry consider to be the top horror attraction in the country. Created by film and television professionals, Netherworld is also noted for its unique themes, stunts, costumes and sets and has been featured on everything from Travel Channel to The Today Show. It was even used as a filming location for the movie Zombieland. Located in my very own city of Phoenix, Arizona, 13th Floor Haunted House is an intense, graphic, theatrical show that will take guests on a gut wrenching ride of visceral thrills and psychological horror. Featuring 60,000 square feet of shocking twists and horrifying turns, The 13th Floor features over 100 performers, amazing costumes, and horrifying thematic experiences that rival television and film in the scope and scale of its production. Located in Austin, Texas, The House of Torment combines two haunted houses, The Reckoning and Cursed, into to one scary experience. The Reckoning is an apocalyptic saga that transports guests to a devastated city that has suffered through alien invasions, virulent out breaks and ample amounts of destruction. This house features massive movie quality sets, giant animatronic monsters, aerial stunts, thrilling special effects, and nonstop action. Cursed is an immersive experience taking guests on a journey through a haunted island where blood thirst savages attack and zombie pirates stalk the living. Located in Pontiac, Michigan, Erebus 4 Story Haunted Attraction features unique scares that you can’t see anywhere else. With over 30 years in the haunted house business, they are masters at creating elements that will grab you, bite you, and even land on top of you. New for the 2011 season, is the War of the Worlds section where a war between humans and aliens is raging. Located in Denver, Colorado, Asylum Haunted House / 13th Floor is actually a combination of four haunted houses – Asylum, 13th Floor, Bloodshed and Zombieland, each with its own story line and scare factors. The frights begin in Gordon Cottingham’s Hospital for the Mentally Insane, The Asylum. Much deeper and darker than the previous levels, the Asylum is a damp and musty place infested with spiders, rats, snakes, and the endless screams of the tortured souls. And if that is not enough scare for you already, hold on to your hats as there re three additional haunted houses to follow. 13th Floor, San Antonio Haunted House from Vishwanand Shetti on Vimeo. Located in San Antonio, Texas, 13th Floor Haunted House is housed in a 105 year old historic building and spans 40,000 square feet across 3 stories. Guests are take through several levels of horror starting from the depths of its decrepit, underground basement. Through the wickedness of its massive gothic cemetery and into its horrifically haunted hotel, 13th Floor patrons will experience a barrage of special effects, animatronic monsters and impeccably detailed sets. Located in Houston, Texas, Nightmare on the Bayou is located directly next to Houston’s oldest graveyard and features 15,000 sq. feet of hauntedness. Nightmare on the Bayou is entering its 12th year in operation and has grown bigger and better every year. 2011 features newly designed scenes, Hollywood quality props, professional animatronics and dozens of crazed actors whose sole purpose is to scare you to death. Based on either your own experience or from the videos above, which haunted house do you feel is the scariest of them all? Let us know in the Comments section of this post. Credit to Hauntworld.com for original list and descriptions. I’m really impressed by the number of these haunted houses that are hosted in real historic buildings. Outside of theme parks, haunts are still relatively few and far between over here in the UK, but this fills with me hope that as they catch on maybe some of our (really) old buildings could be put to good use.